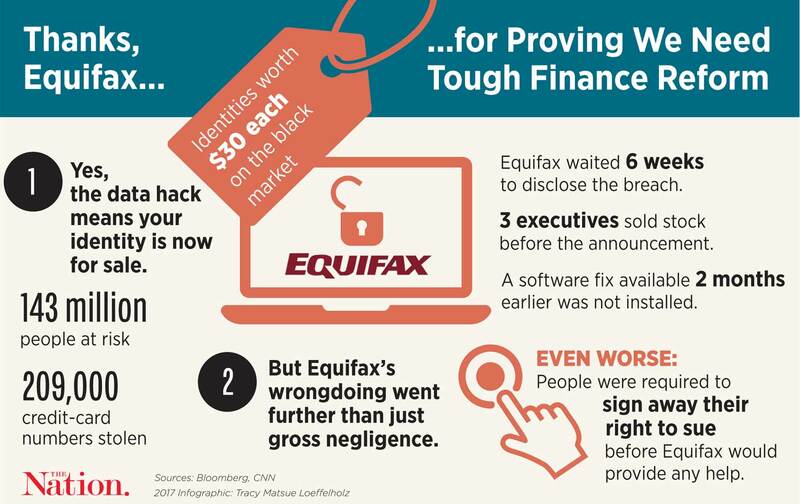 Equifax’s blunder does more than any white paper to demonstrate the need for financial reform. The financial sector is one of the biggest enemies of reform and accountability. Yet by consistently screwing up, it has also become the most influential advocate for outside regulation. Consciously through malice, or unconsciously through its size and complexity, it has time and again demonstrated the importance of the existing rules and the need for additional oversight. Take JPMorgan’s “London Whale” scandal of 2012. At the time, the company bragged of its “fortress balance sheet” and opposed many of the rules being put in place on the arcane financial instruments known as derivatives. The general idea was that the housing crash and subsequent panic was a one-off event, and the banks would be just fine monitoring themselves. Then, seemingly out of nowhere, a JPMorgan derivatives trader in London lost $2 billion. That instantly killed any efforts to roll back regulations in Congress; instead, the worry became whether the Dodd-Frank financial-reform act went far enough to ensure that a bank couldn’t suddenly collapse the economy. The incident led to fresh demands for higher capital requirements, and derivatives regulators used their new powers to impose a $100 million fine on JPMorgan for manipulating the credit markets. Or take criminal charges. As Jesse Eisinger discusses in his new book, The Chickenshit Club, the Obama administration decided not to aggressively pursue criminal charges against the banks for wrongdoing in the financial crisis. Yet criminal conduct would go on to be rampant: The banks knowingly manipulated key financial markets such as the LIBOR interest-rate and the foreign-exchange markets. HSBC laundered money for Mexican drug cartels. Abuses in the foreclosure chain resulted in people losing their homes through the banks’ fraudulent paperwork and improper processes. The subsequent crimes showed, in retrospect, how wrong the Obama administration was in not seeking prosecutions. Wells Fargo also demonstrated the need for an independent Consumer Financial Protection Bureau, which was set up under Dodd-Frank. Local newspapers and prosecutors discovered that Wells Fargo was abusing clients by opening fake accounts in their names, but there was little they could do about it: City prosecutors are under-resourced and lack the regulatory authority necessary to challenge a national bank. The CFPB, however, was designed to take on just such malfeasance. Wells Fargo is the poster child for how broken the regulatory structure is without a dedicated consumer cop on the beat. These kinds of arbitration agreements replace courts with a private judicial system of company lawyers, and they have since metastasized across the entire economy. The CFPB recently finalized a rule that would outlaw these mandatory agreements by financial companies starting next year. Among other things, the rule would prevent Equifax from forcing people into arbitration after it goes into effect. Yet under an obscure congressional procedure, Republicans have the ability to repeal this rule with only 50 votes in the Senate. Though they might still do it, they’re having a harder time now, since they would be on the hook for any further abuses. As reported by David Sirota, Equifax was one of the lead companies lobbying against the CFPB rule. But Equifax’s calamitous blunder, more than any white paper, demonstrates the need for strong new regulations to protect our personal data. If the rule survives, we can thank the companies whose own horrible gaffes demonstrated the need for it in the first place. Editor’s note: An earlier version of this article referred incorrectly to the agreement that Equifax originally required consumers to sign. It is an arbitration agreement, not a non-arbitration agreement. The text has been corrected. Mike KonczalTwitterMike Konczal is a contributor to The Nation and a fellow at the Roosevelt Institute.